Sony Ericsson's Facebook competition has come to a close - the Mix Walkman and the txt pro are now fully official. Also, the video reviews of the four finalists that got to review the phone are available for you to watch - and don't forget to vote for your favorite, they will win a big prize. Both new Sony Ericsson phones are feature phones but they pack some compelling functionality. They have Xperia-like UI, just like the Yendo. The Sony Ericsson Mix Walkman has the looks of the Xperia Mini but there's Walkman blood in its veins. The Zappin button is a particularly interesting feature - press it and the phone will preview the chorus of the next song. That's right, just the chorus, which is the most recognizable (and often best) part of the song. The Mix Walkman is also a pocket karaoke machine - it can suppress the voice track of any song so that you can show off your vocal talents. 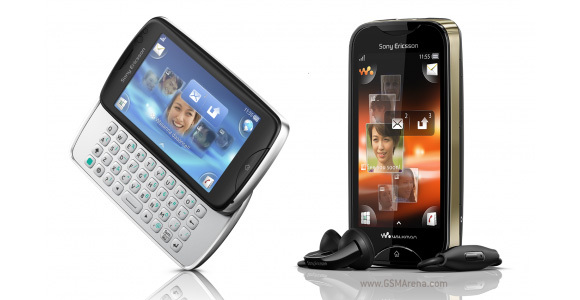 The Sony Ericsson Mix Walkman is a very compact phone (95.8 x 52.8 x 14.3mm, 88g) with a 3" WQVGA screen, 3.2MP camera and exchangeable bands to personalize the phone (they come in the box). You get Wi-Fi connectivity and microSD card slot too (for cards up to 32GB). Check out one of the finalist videos that shows off the Sony Ericsson Mix Walkman. The Sony Ericsson txt pro goes for Xperia pro looks and leverages on social networking integration. It has a 3" WQVGA screen and four-row QWERTY, 3.2MP camera, Wi-Fi connectivity and microSD card slot. The txt pro has a new Friends application that gives users a glance at the latest updates from the Facebook and Twitter accounts of five of their friends. Here's one of the two Sony Ericsson txt pro video reviews that made it to the finals. Both the Mix Walkman and txt pro are 2G only phones (they both have Wi-Fi though). They're expected to come out in Q3 of 2011, but there's no pricing info yet. By the way, you can watch the other two video reviews here. Update: Currently, the video reviewing contest results has been taken down by Sony Ericsson and even the videos above are now unlisted. We hope they get the stuff back online soon.